Pearl Bailey was a gifted artist and humanitarian, whose performing career spanned all mediums. She began as a singer and dancer in her father’s Pentecostal church at the age of three. A childhood ambition to teach was side-railed in 1933, when she won an amateur contest at Philadelphia’s Pearl Theater. Bailey quickly dropped out of school to join the vaudeville and nightclub circuits of Pennsylvania and Washington DC. She began to work with Big-Band orchestras in the early 1940s, and toured with the USO from 1941 until the year of her death. Her acting career began in 1946, when she starred in the Broadway musical St. Louis Woman, a role that netted her an award for best Broadway newcomer. The following year the first of her films, Variety Girl, was released. A television career beginning in the 1950s led to her own ABC series, The Pearl Bailey Show, in 1970-71. Bailey also authored six books. Bailey was honored by the Screen Actors Guild in 1978 for “outstanding achievement in fostering the finest ideals of the acting profession,” and by the Women’s International Center in 1989 for her active support of human rights around the world. Other awards and honors include a Tony Award for her title role in the all-black cast of Hello Dolly in 1967; a 1970 appointment as America’s “Ambassador of Love” by President Richard Nixon; and the Medal of Freedom, presented by President Ronald Reagan in 1988. Bailey served as Goodwill Ambassador to the United Nations under the administrations of Presidents Ford, Reagan and George Bush. 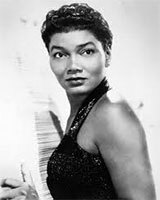 Pearl Bailey returned to school in 1978, and received a bachelor’s degree in theology from Georgetown University at the age of sixty-seven, as well as an honorary doctorate degree from the school.